Perigee ("Super") moonrise over Sydney Harbour Bridge. 14 November 2016 at 7:41pm. Waxing gibbous, 99.9% disc illumination. 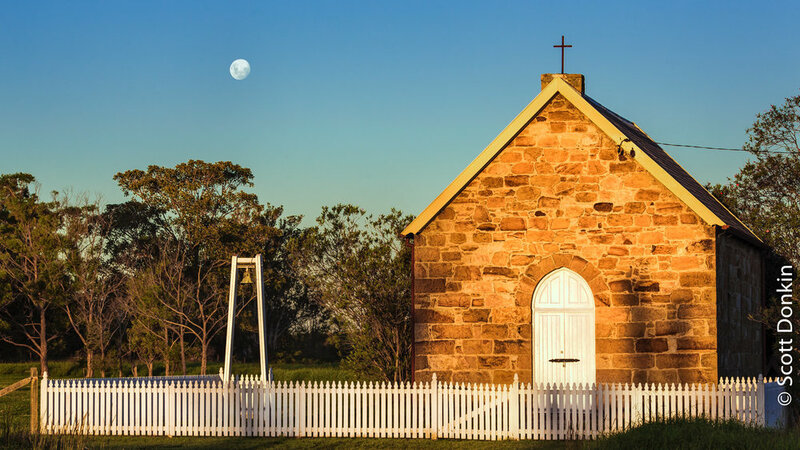 Moonrise over the chapel at Tomago, New South Wales. 9 April 2017. Moonset over North Sydney skyline. Sunrise, 3 March 2018. Moonset over Sydney Harbour, city skyline and Sydney Harbour Bridge. Sunrise, 9 August 2017. Moonrise over ANZAC Bridge, Sydney. 7:06pm 28 February 2018. Waxing gibbous moon, 96% disc illumination. Moonrise. Sufers Paradise, Qld. Dusk, 13 December 2016. Rising full moon and clouds at dusk. Sydney. Perigee ("Super") Moonrise over Nobby's Head Lighthouse at sunset. Newcastle, New South Wales. Waxing gibbous, 99.8% disc illumination. 3 December 2017. Moonset at dawn. Sydney skyline. 8 August 2017. Moonrise over Vaucluse, Sydney at dusk. 29 May 2018. Sail of the Sydney Opera House against a rising Perigee ("Super") Moon. 15 November 2016.